News: technology company Microsoft's research branch has combined projection mapping with motion sensors to turn enclosed spaces into immersive augmented experiences. 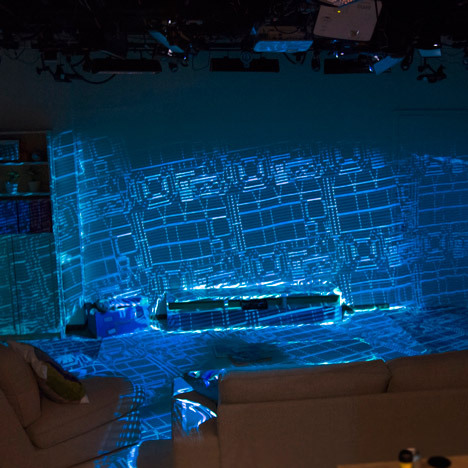 Microsoft Research has released a film demonstrating its "proof-of-concept prototype" for RoomAlive, which uses a series of projectors and depth cameras to overlay existing surfaces with images – turning the entire room into a giant interactive screen. The experience is created using ProCam units, which combine a field-of-view projector, a Microsoft Kinect motion sensor and a computer. A series of these units are mounted onto the ceiling, facing in different directions so the fields of view overlap. The units automatically calibrate so they can be easily installed by users. Each ProCam – which can differentiate between horizontal, vertical and floor-plane surfaces – provides depth maps that form a digital model of the space. The projectors then cover the room, furniture and people within it with pixels that can be used for both input and output. This allows users to interact with the graphics, which respond to movement and touch. Microsoft's example scenarios include a Star Trek-esque Holodeck, a factory interior and a river running along the floor. "These experiences are just samples of what is possible with RoomAlive," said the commentary on the video demonstration. "In summary, RoomAlive enables any living room to be transformed into augmented reality display." The technology was designed for enhanced video gaming experiences, but has the potential to be used for interactive installations and spatial planning.